View More In Flatware - Page 5.
grabease utensils are the safest way for toddlers to start self-feeding. grabease are designed to give toddlers the opportunity to eat independently with a proportional tool for their natural hand grasp and motion with a choke protection shield. Details of our design: Ergonomically designed handle - for a more natural hand feeding motion. Choke protection barrier- Safe for baby self-feeding to promote confidence during independent eating. 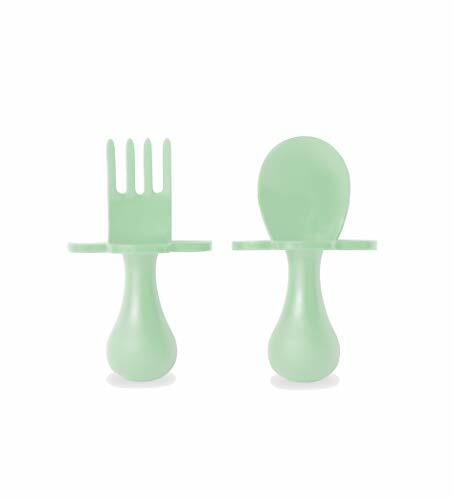 Great utensil starter for children in their baby led weaning stage to toddler eating. Highly recommended by occupational therapist for children's finger strength development. grabease spoon and fork come with a chic eva pouch to-go. grabease comply with all USA regulations, they are tested and certified to the highest standards including prop 65, BPA, lead, Phthalates and FDA requirements. Dishwasher safe - up to 160 degrees. If you have any questions about this product by Elli&Nooli, contact us by completing and submitting the form below. If you are looking for a specif part number, please include it with your message.